A silver gilt finger bowl by Tiffany & Co.
Every sentimental or momentous occasion deserves special recognition that can be marked with the giving of gifts. However, when an item of wearable jewellery might not be appropriate or is too gender-specific or personal, suitable alternatives are still available to mark a rite of passage, whether it is a birthday, wedding, anniversary, or any such occasion. In all likelihood, when the average person thinks of jewellery, he or she envisions something bright and shiny dangling from earlobes or encircling a wrist, finger, or neck. But not all jewels have to be displayed on the body. If well-designed jewellery can be considered wearable art, then also consider the myriad desirable objects that occasionally come up for sale at auction. Just as a beautiful brooch accents a particular outfit, a bejewelled and precious metal object can embellish a room‚Äôs d√©cor for the discerning buyer with an eye for the unusual and a well-developed sense of esthetics. 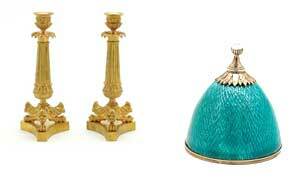 The ambience of every room in the house can benefit from the unusual, the elegant, or the one-of-a-kind. Imagine a clock displayed on a traditional mahogany desk or on a see-through modern interpretation created in Lucite. Perhaps a model that is not only an efficient keeper of time, but denotes the classic simplicity of the House of Cartier and is also indicative of the buyer‚Äôs good taste. An Edwardian example in violet engine-turned guilloche enamel would be the perfect accessory on a kidney-shaped vanity table skirted in lavender taffeta or silk, or placed upon a mirrored bedside table in a romantic boudoir. Tuck a petite turquoise enamel perfume bottle topped with a moonstone beside it to complete the attractive tableau, combing fun and function and providing a relevant flourish. In the living room, standing on a bookshelf or sofa table, turn-of-the-century picture frames in nephrite embellished by silver and gemstones capture the essence of the images portrayed within them, and support a link to a grander lifestyle in the distant past. Candlesticks in gold plate shine, either alit or not, on the dining power room table or sideboard, adding brilliance and light to a festive celebration. 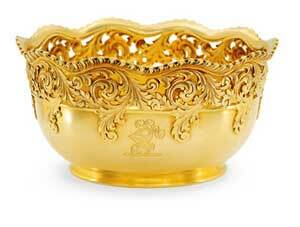 Silver gilt finger bowls add a touch of civility to a simple chore. 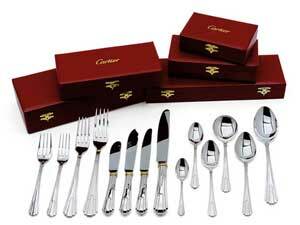 Also in the dining room, place settings of flatware from Cartier or Georg Jensen can elevate the most mundane leftovers into gourmet territory. Gold compacts and pillboxes can easily add sparkle to the guest room or could be tucked into an evening bag to enhance the most basic little black dress worn at a swish soiree. Every important document deserves to be signed with a quality pen designed with the luxurious artistry of colourful lacquers and gold, ideally tailored for an up-and-coming executive or the CEO in the corner office. An objet d‚Äôart, as a jewelled accent for the home and office, can offer the discerning buyer the same impact and pleasure as jewellery, and serve to delight any onlooker or admirer-an extension of its design sensibilities and aspirations. 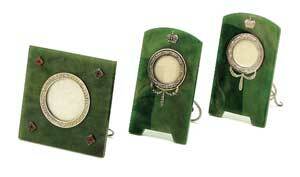 Nephrite and silver picture frames. Gold-plated candlesticks. Turquoise enamel and silver perfume bottle.